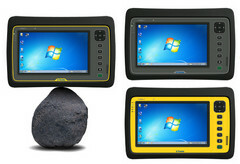 The California-headquartered manufacturer Trimble has reportedly introduced a new rugged tablet computer, dubbed Yuma 2. According to the company, the device is designed for “ease of use and high performance mobility” and will hit the store shelves in Q4 2012, priced at $2,995 and up. Trimble further claims that unlike other tablets on the market that only come with an exterior shell for protection, the Yuma 2 is built to meet the MIL-STD-810G military-standard for toughness (temperature, humidity, vibration and shock) and has been given an IP65 rating, which means it is safeguarded against dust and water ingress. Apparently, the mobile product is equipped with a direct sunlight readable display that measures 7 inches in diagonal and has a native resolution of 1024-by-768 pixels. In addition to the capacitive multi-touch Gorilla Glass panel, the Yuma 2 sports a Cedar Trail Intel Atom N2600 chip that offers two cores running at 1.6GHz, 3.5W max TDP and the integrated Intel GMA 3600 graphics card. Beneath the screen, the slate PC features 4GB of DDR3 RAM and a choice between a 64GB or 128GB Solid-State Drives (the 128GB model with 3.75G WWAN will set you back $3,645). Connectivity-wise, the Yuma 2 packs Wireless LAN 802.11 b/g/n, Bluetooth 4.0 and optional 3.75G radios complemented by two USB 2.0 ports, a GPS receiver and an HDMI interface. Based on a Windows 7 Professional operating system, Trimble’s new portable device is 3.81cm (1.5-inch) thick and weighs 2.6lbs (1.18kg) with the integrated standard 3000mAh battery that lasts for around 8 hours on a single charge. Customers are supposedly also provided with a secondary battery pack for up to 16 hours of runtime. Other specs of the Yuma 2 tablet include a 5MP rear-facing camera with AF, built-in Trusted Processing Module (TPM) and Kensington lock for enhanced security.